South African provinces are preparing to deliver millions of textbooks and learning materials needed for the 2013 academic year. the results of those who will be going to higher grades in the New Year. It is also a time of excitement and anticipation for those who will be attending school for the first time. It is our priority as government to make the process of either attending school for the first time or continuing one’s education as seamless as possible. This makes the timely delivery of textbooks and educational tools to schools even more important so that pupils have the means to excel. In addition, it ensures that government’s priority of providing high quality education to all is supported by the availability of essential study material. Excellent educational outcomes are also influenced by adequate access to resources such as the right school infrastructure such as classrooms, libraries, decent sanitation and running water. Importantly, motivated and committed principals and teachers also form an integral part of a well-functioning learning environment and ultimately contribute to high levels of academic performance. Another vital aspect is the well-being of the pupils themselves. We still find that many of the pupils face the extra burden of poverty or adverse family circumstances. As a democratically elected government we committed ourselves to improving the quality of education for all South Africans. Over the years we made significant budgetary allocations to ensure education enjoys the priority status it deserves. Government is making great strides in mitigating some of the factors that have an adverse effect on education and to improve its quality and ensure equal access to all South Africans. This commitment is borne out by figures from the 2011 General Household Survey (GHS) from Statistics South Africa. The figures show that policies to make education affordable to previously disadvantaged children are making inroads and are starting to bear fruit. The 2011 GHS found that almost two-thirds of pupils have access to free basic education through Government’s policy of “no fee schools” with the number of pupils increasing from 0.7% in 2002 to 55.6% in 2011. A high proportion of these pupils were in Limpopo (89.7%) and the Eastern Cape (71.8%). No-fee schools were introduced in 2007 to ensure that schools are accessible and affordable. Over 40% of schools in South Africa were declared no-fee schools and these ranked among the poorest fifth of schools in the country. 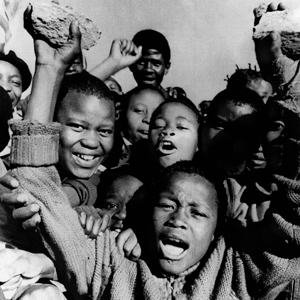 A report by the South African Human Rights Commission and Unicef entitled South Africa’s Children: A Review of Equity and Child Rights, showed that the country has made substantial progress in expanding enrolment in Grade R.
The official government figures from Mid Term Review Report released in June this year also confirmed that enrolment in GradeR doubled from 300000 to 705000 between 2003 and 2011. In addition, most GradeR children now benefit from government’s programme of Early Childhood Development (ECD). The ECD programme promotes the development of young children from beginning to the foundation phase of schooling. These range from provision of opportunities for children to learn together in structured programmes and preparation for formal schooling. During her Budget Vote speech in Parliament this year, the Minister of Social Development Bathabile Dlamini emphasised that government’s qualitative ECD policy and implementation strategy will, undoubtedly, be our most important policy interventions over the next 20 years in relation to the enhancement of the overall well-being and development of South Africa’s children. This plan is in line with government’s vision for South Africa by 2030 under the National Development Plan (NDP). Through the NDP, early childhood development is a top priority with all children attending at least two years of pre-school education. As a country we have been steadily moving towards a social reality on the delivery of Section 29 of the Constitution where “everyone has the right to a basic education”. As the South African Human Rights Commission and UN Children’s Fund report pointed out, the near-universal primary education has been achieved in all provinces and one in two pupils in public schools receives free education. School attendance among children has increased steadily in the past 15 years. While there are still many challenges and more needs to be done, conditions in the education sector have fundamentally improved since 1994. As government we call on communities, parents and guardians to become more involved in our children’s education. Let us all work together in ensuring that our children are given every advantage as they strive to lead our country and economy in the future. WHITE EDUCATION IS NOT DESIGNED FOR BLACK LIBERATION!